If you live near Eagle Creek, you already know the beauty of walking the trails throughout the park. Now, westsiders of Marion County have plenty to anticipate with the continued construction of the Eagle Creek Trail. Upon completion, this network of trails will cover more than 16 miles, running from Eagle Creek Park and reservoir to the White River. 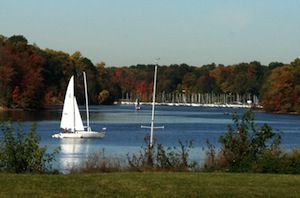 As the largest municipal park in Indianapolis, Eagle Creek includes a 1,400-acre reservoir and spans nearly 4,000 acres of land, including a nature preserve. The land was once owned by Josiah Kirby Lilly, Jr., president of Eli Lilly and Company from 1948 to 1953, and later by Purdue University. The greenway system offers residents of Indianapolis several unique paths to experience the rolling terrain and rugged beauty of the area, along with connections through various urban hotspots. Walkers, runners, cyclists and cross-country skiers will find beauty and serenity year-round on the sprawling grid of paths traversing the greater Indianapolis area. Two sections of the Eagle Creek Trail have been completed. The trail surface is eight to 12 feet wide and complies with ADA regulations for wheelchair use. Two miles on the south end of the trail, at Raymond Street, will eventually connect with the White River Wapahini Trail. Greenway planners anticipate trail construction will quickly progress toward the south, eventually connecting with the planned B&O trail through Speedway. The north end of the trail starts at the Pike Youth Soccer Complex at 56th Street and Reed Road. This 1.8-mile section flows toward the Eagle Creek Airport and 46th Street.There are a few neighborhoods and subdivisions along Reed Road, allowing walkable access to the trail.There is also parking at the soccer center if you don't live close enough to walk to the trail. These Eagle Creek neighborhoods are located off Reed Road, within walking or biking distance to the north entrance of Eagle Creek Trail.